A high level of creatinine in the bloodstream is often an indication of kidney dysfunction. A high protein diet, however, can bring about high creatinine levels as well. In spite of its potential toxicity, creatinine may, depending on the health of your kidneys, be flushed from your body and not pose a danger to your health. However, high protein intake does pose other health risks. Creatinine is filtered out of the body solely by your kidneys. Therefore, a high concentration of creatinine in the bloodstream is, clinically, taken to mean that your kidneys may not be functioning properly. However, because a diet high in protein may also raise creatinine levels, it's important to be aware of the difference between diet-induced creatinine formation and creatinine levels associated with reduced kidney function. Creatinine is a toxic by-product of the natural breakdown of creatine phosphate in muscle. Once produced, it is filtered by the kidneys and released via the urinary tract. According to “Clinical Methods: The History, Physical, and Laboratory Examinations," while high creatinine levels are a good indicator of kidney function, they may also be a result of a diet high in protein. People follow high protein diets in order to promote muscle growth. When more protein is metabolized by the body, creatinine secretion is increased. Healthy kidneys are able to filter creatinine from the body. According to the U.S. National Institutes of Health, unhealthy kidneys are unable to filter excess creatinine from the body, resulting in its accumulation in the bloodstream in high quantities. 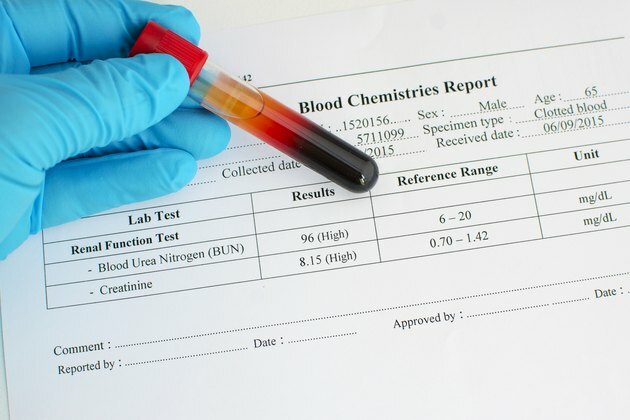 If an increase in dietary protein intake has occurred without any other symptoms, then raised creatinine levels should not be a great cause for concern. In a 1996 study conducted by researchers at the University of Ulm in Germany that sought to determine the effects of a chronic dietary intake of protein on renal function in healthy subjects, 88 volunteers consuming varying amounts of protein were examined over a period of four months. Results indicated that although creatinine excretion was significantly greater in those who consumed high amounts of protein, their kidneys coped with, and eventually adapted to, the increased intake of protein, and were thus better able to filter excess creatinine from the bloodstream. Although a high protein diet may increase creatinine levels, the effects of which may be efficiently handled by healthy kidneys, it is crucial to be aware of the implications presented by a diet which is not only high in protein, but also low in carbohydrates; such as those promoted to induce rapid weight loss. According to experts at the National Institute of Advanced Industrial Science and Technology, a high protein, low carbohydrate, or ketogenic, diet increases your risk of hypofibrinolysis, which can cause blood clots. Medline Plus states that a diet high in meat protein may increase cholesterol levels and contribute to gout, with its typical symptoms of hot, red, swollen joints. National Kidney and Urologic Diseases Information Clearinghouse: The Kidneys and how they work.